Having rescued an immensely valuable book from a long-lost library, Jay's joy turns to dismay when it proves to be unusually... chatty, and possessed of a fine, filthy vocabulary besides. What manner of enchantment created such a strange and powerful book is a mystery to the Society, but Ves is determined to solve it. Modern Magick - Toil and Trouble has not been tagged yet. Help others find Modern Magick - Toil and Trouble by tagging it! Modern Magick - Toil and Trouble has not been reviewed yet. 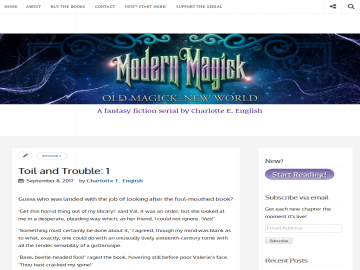 Modern Magick - Toil and Trouble has not been recommended yet.